John Sherwood: “SALSA: A Method of Developing the Enterprise Security Architecture and Strategy”; COMPSEC 96, London, October 1996. SALSA? That’s right – SALSA. But, more about that in a bit. So where did that spring from? Was it out of nowhere? No, not quite. The seeds were planted a year earlier. At that time, in autumn 1995, I was working as a consultant at S.W.I.F.T. headquarters in La Hulpe, Belgium. S.W.I.F.T. had recently been reorganised to create a new department called Global Information Security (GIS) to address some issues raised by the then external auditors. Although there had been an Inspection Department for many years (effectively an internal audit function), there had been no explicit and proactive security function. The new department was created to fix that omission. It will tell you a lot about the cultural status and popularity of ‘Information Security’ at the time that many people would say that ‘GIS’ was short for ‘get it stopped’. That was the reputation that ‘Information Security’ had gathered over three decades since its emergence in the late 1960s. The corporate information security team was seen (often for good reason) as the ‘business prevention department’. “No, you can’t do that, it’s not secure” was the catch phrase that had earned that reputation in many organisations. The newly appointed Director of GIS at S.W.I.F.T. (Erik Guldentops, previously the Chief Inspector) was keen to make sure that this poor reputation was dispelled, and that Information Security was seen as adding a positive contribution to the business of S.W.I.F.T. That business was, and still is, the transfer on a global scale of several trillion dollars per day between the world’s largest banks. (Yes, that eye-watering number is correct). Erik’s mandate in his new appointment was to create a five-year information security strategy and get the S.W.I.F.T. Board to approve a significant budget to achieve this objective. The currency at the time (pre-Euro) was the Belgian Franc (BEF), which had a low exchange rate versus the dollar or the pound sterling. Thus the budget numbers tended to be large ones, quoted in millions of BEFs (MBEFs) or mega-BEFS as we affectionately referred to them. Erik needed to justify a multi-mega-BEF budget, for which he needed a plan that could be shown to the Board. Those of you who are relatively new to the game of research will be thinking “Why didn’t they just Google it?” The answer is: because there was no such thing as Google in those days, or HTTP, or WWW. There was a public internet-searching tool called gopher, which pre-dated HTTP and the World Wide Web as the document-structuring platform. Using gopher, I managed to find no other useful references to ‘security architecture’. You people today don’t know how lucky you all are with the tools now available. So we had a starting point: ISO 7498-2: OSI Security Architecture. What’s amazing about that is that it was an outstandingly sound conceptual model from which to build a full-scale security architecture model and framework. It may have been the only document we could find, but it was the best possible. It forms the heart of the SABSA layered stack even today. Of course, at this stage we were working on a security architecture model for S.W.I.F.T. It was only a year later, when I published the paper at COMPSEC in London, that this work was presented outside of S.W.I.F.T. under the name SALSA. Yes, the first publication was called SALSA, which stood for Sherwood Associates Limited Security Architecture. It was Andy Clark’s (a co-author, along with David Lynas, of Enterprise Security Architecture: A Business-Driven Approach) idea to use that name and we liked it. The original paper was published by Elsevier Science in their Computers and Security journal, as: “SALSA: A Method of Developing the Enterprise Security Architecture and Strategy”; Computers & Security, Volume 15 No. 6, 1996. Apparently that article is still available today. Some time later I received a ‘cease and desist’ letter from an aggressive firm of New York lawyers that claimed I was abusing the trademark of their client. The client had a general business software package of the same name. I wrote back and politely pointed out that there was no conflict, but an even more aggressive letter threatening court action followed. I spoke to Andy and we decided we had two choices: spend the rest of our lives defending the action or change the name. Guess what we did. At least it showed that the published article was being read. And so, SALSA became SABSA. ISO 7498-2:1989: Information Processing Systems – Open Systems Interconnection – Basic Reference Model – Part 2: Security Architecture. ISO 7498-2 introduces the concept of security services, security mechanisms and security management. More importantly, it makes clear differentiations and relationships between these three concepts. 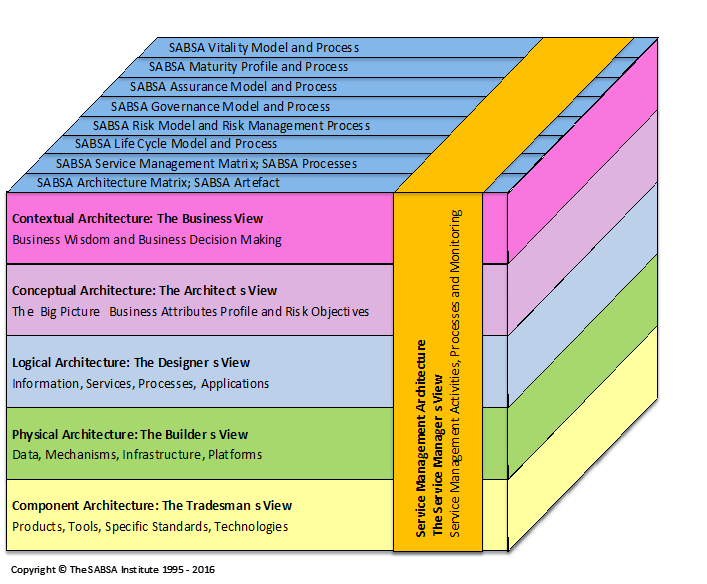 The core conceptual relationships described in ISO 7498-2, as extracted for the original SABSA layered security architecture framework, are summarised in Figure 1. We extended the ISO 7498-2 model by adding a business layer and a strategic layer above the services layer, added a products and technologies layer below the mechanisms, and extended the management both up and down to indicate that it is required at every layer of the model. Thus, was born the first SABSA architecture model. This was developed further in subsequent iterations, but more of that later on. The SABSA story now spans 21 years and has had many pivotal turning points along the way. What you see today is the result of much work and input from many different sources. In the next blog article, I shall track that development path that took SABSA from these early beginnings to the present day. Figure 3 shows just how far this original model had evolved, with multiple backplanes of overlaid additional models and frameworks. The layers are now considered as ‘views’ according to the roles and ‘viewpoints’ of the leading role-players at each layer.